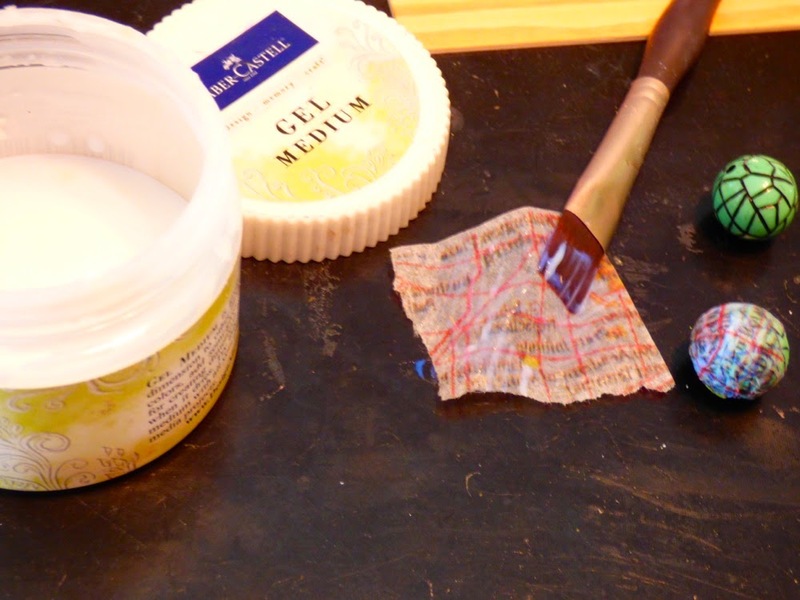 Art Talk: ComposiMold and The Mixed Media with Gelatos kit! Hello my artsy friends! 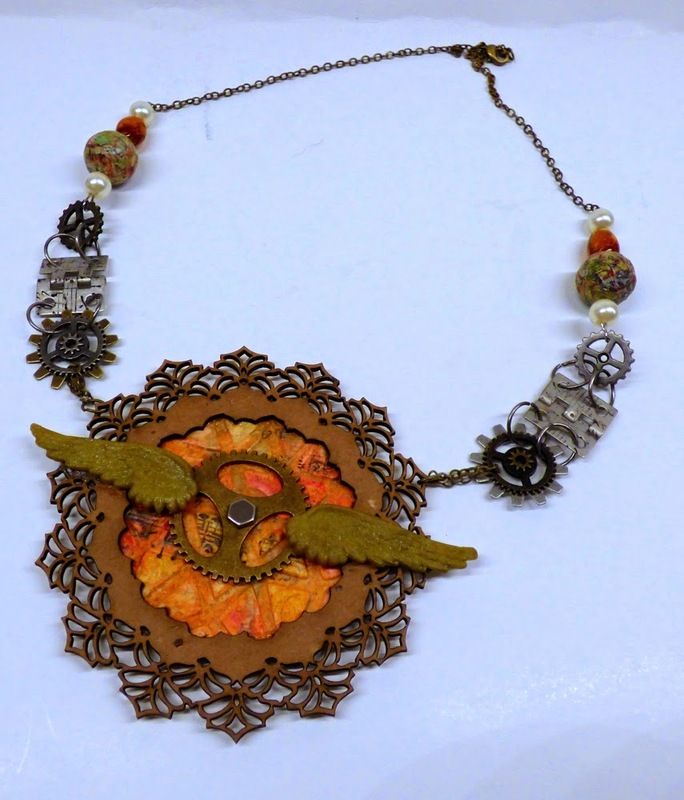 I am sharing my necklace that I made using our product feature, ComposiMold and the Mixed Media with Gelatos kit that I designed for Faber-Castell Design Memory Craft! Since I have created the original artwork in this kit, I decided to challenge myself and create a wearable piece of artwork. 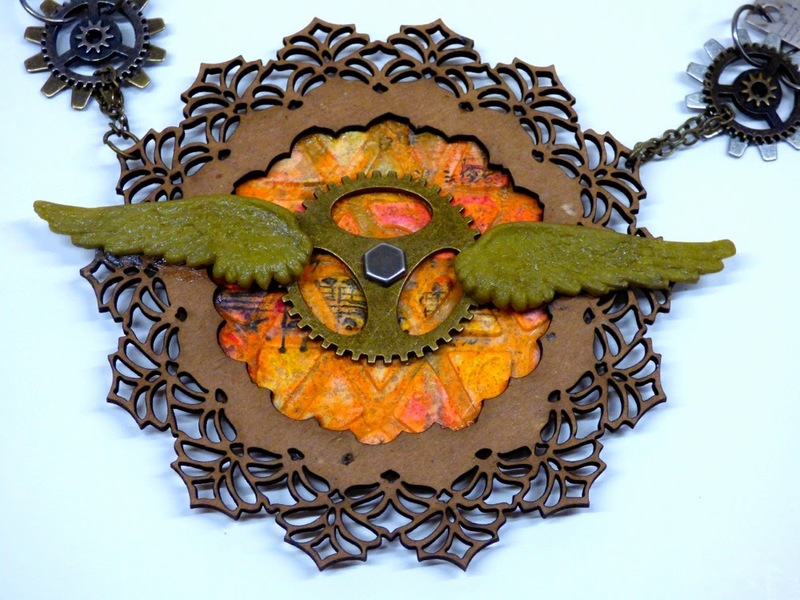 ComposiMold was a new product to me but I immediately knew I wanted to create something with wings. I loved how easy it was to use... just heat, stir, and pour over items (make sure the items are adhered to the bottom of the container before pouring). I put the mold in the refrigerator to cool faster. You know me, I hate to wait! Here's what it looked like when firm and removed from the container. I took the Cold Porcelain clay from the Mixed Media with Gelatos kit and mixed some with the Gold Champagne Gelato® and pressed it into the wings. 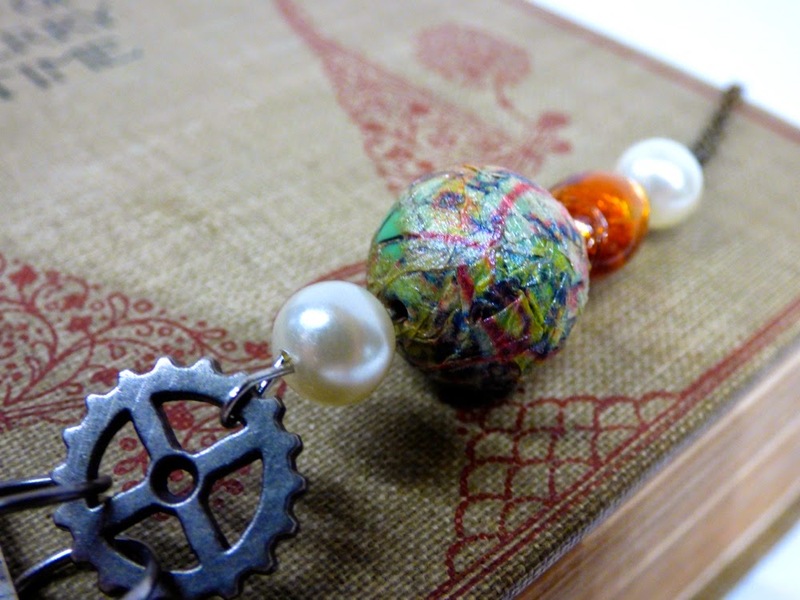 I used some of the map tissue paper to cover some beads that just weren't that pretty! 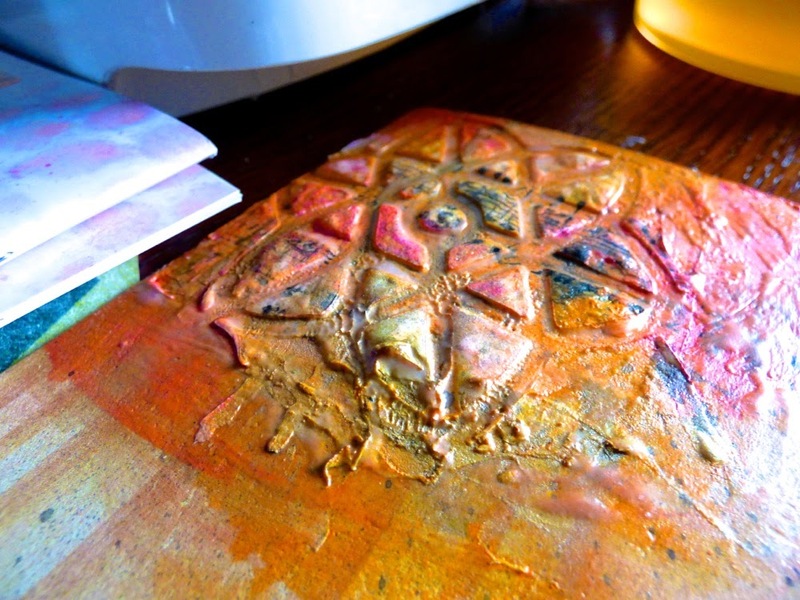 I used the Textural Accents Gel Medium to adhere the paper. 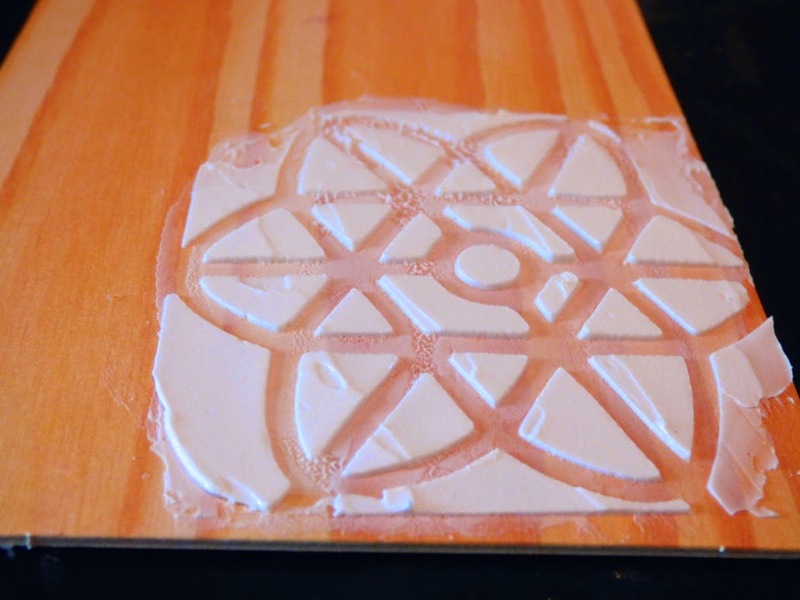 Next, I spread I light layer of the Whipped Spackle with the palette knife on a section of the wood veneer board and then placed the stencil over the layer and added more Whipple Spackle. 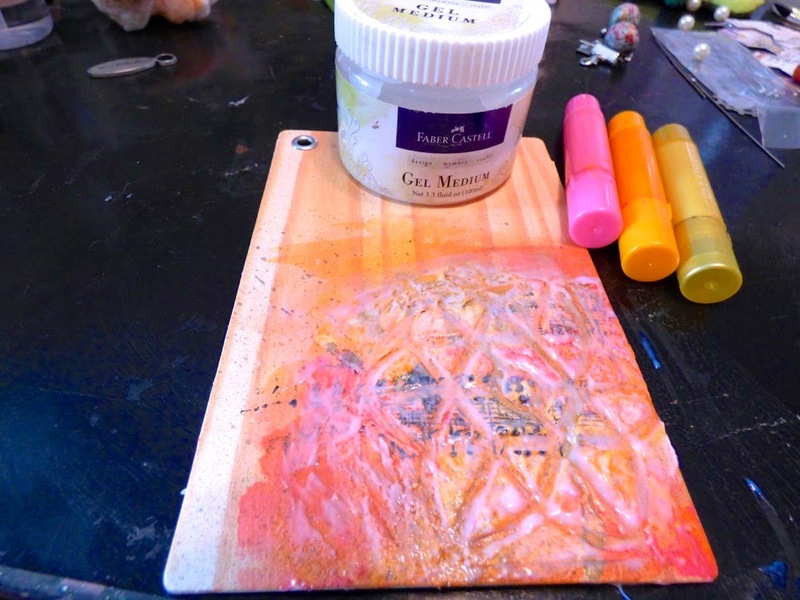 Once dry, I added the three Gelato® colors and stamped with Stamper's Big Brush pen over a rubber stamp. I coated the entire thing with more Textural Accents Gel Medium. Here is a good photo of the texture created with the Whipped Spackle. I cut out the main shape and adhered it to the back of a chipboard doily shape from UmWow Studios. 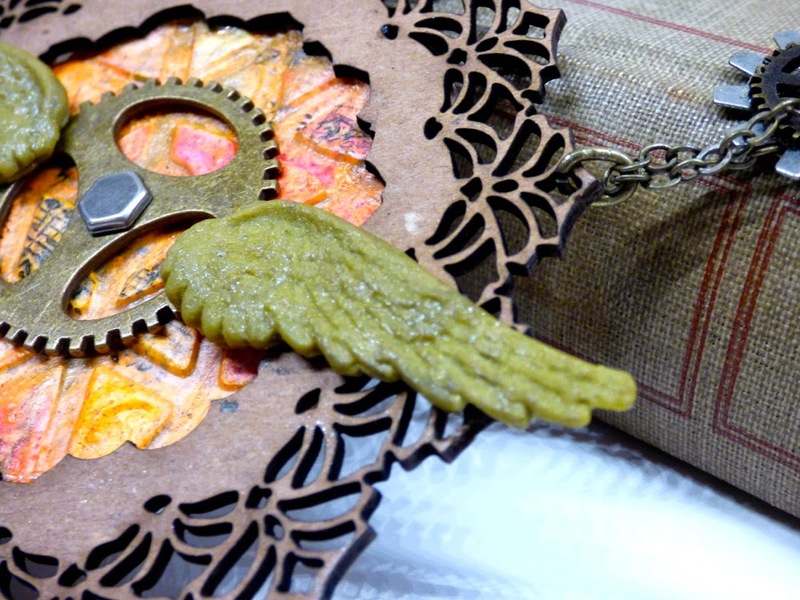 A gear, brad and the molded wings were added. See that bead I covered? So cute! I used a hinge and stamped on it with the Stamper's Big Brush Pen. Just a fun accent. I can't wait to wear this with a fun outfit and show off these colors and fun products! I have a blast creating this unique wearable art and I hope you enjoyed it today! Leave a comment on the Faber-Castell Design Memory Craft blog about how you plan to use both products, and you'll be entered in a giveaway to win a set of the ComposiMold and the Mixed Media with Gelatos Kit. 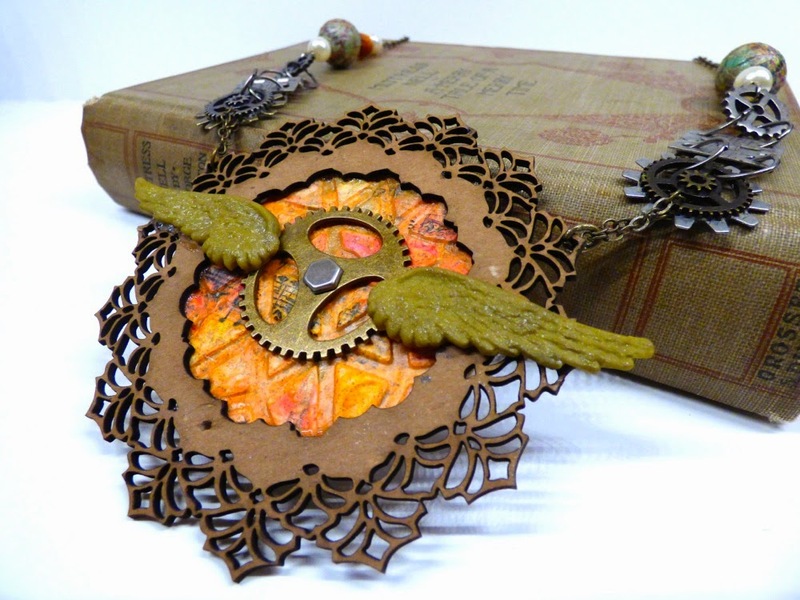 BUT also, I have a Mixed Media with Gelatos kit to giveaway here! You have to leave me a comment on my blog here for a chance! I will choose my winner on Friday, July 18th at 8pm. 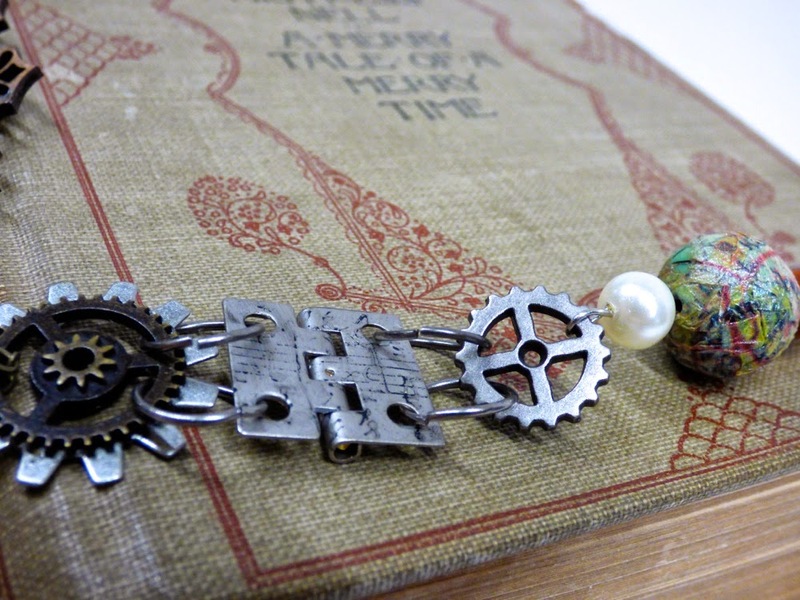 What a fabulous necklace, Jen! Love that bead you covered. I would love to make one of these. Mind blowing, as usual :) Seriously amazing stuff, Jen!!! the necklace is beautiful. My granddaughter is into jewelry making and I know she'll love seeing this. 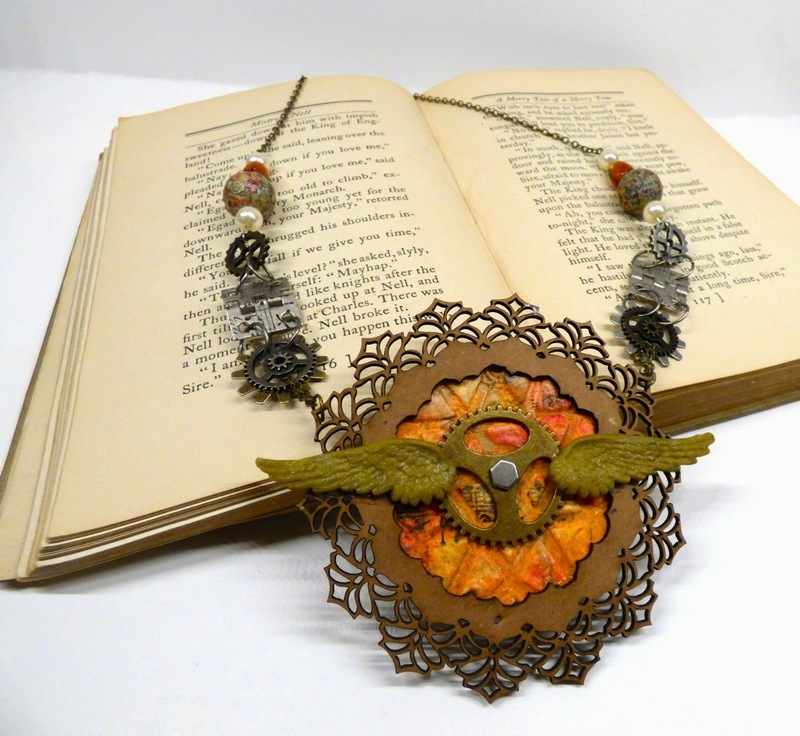 She'll help me get started on making similar pieces (that I hope are as wonderful as yours). thanks for the extra chance to win a kit that I'll share with Christine.. I am in love with your necklace! I feel like an idiot for not thinking to combine my love of Gelatos with my love of creating jewelry. Your necklace has depth and interest. It's beautiful! Thank you so much for the inspiration you've given me! Wow. This is so incredible and ultra inspiring!!! You are SO talented Jen! Thanks for sharing your wonderful work and for inspiring me be more confident with ComposiMold!!! Great...send me in another art direction!!!! Like I don't have enough things swimming in this head! :0). Love it Darlin! Have you picked a winner for you prize?